This past week I have been moving out of my quarter of a million dollar mansion and into a tiny house living space. Granted, it is beside my store, and I will be spending lots of time in the 1500 square foot store building, but the tiny house is going to be a big change. We have had to examine everything we own and ask ourselves if we really want all this stuff, do we really need it, and do we really love it? The answer, unsurprisingly, was often no. We have donated 5 truckloads to a great local charity, taken one load straight to the dump, and hauled off a load of scrap metal from the odd things I had lying around. I spent the last night in my mansion this past Thursday like I did the first night in it; sleeping on the floor ready for an adventure. It made for a good bookend to that chapter in my life. I find this purging of junk to be borderline spiritual; almost a cleansing off of the effects of living in a material world. 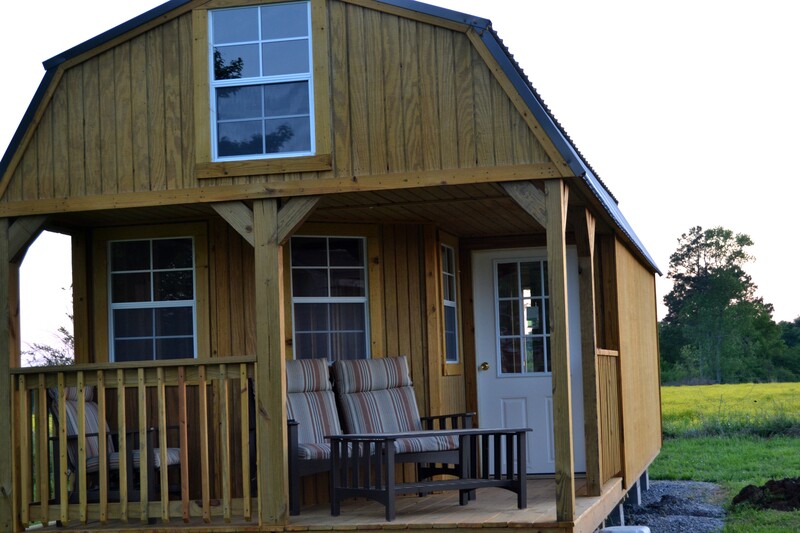 The tiny house idea that is sweeping the nation is an affordable solution to some of the nation’s housing problems. I am going to test whether or not it is realistic. I have already had a few walls put up in the tiny house, and have the plans ready for completion over the next couple of weeks. Until my office is completed, I am stuck with having an outside office in the glorious Buck’s Pocket State Park, sitting on a shaded bench. Really, I couldn’t ask for a better place to write and conduct business. Some people have called this move back to Grove Oak a ‘coming home,’ some have called me a genius, and some have called me crazy. I don’t know which, if any, is true. I will ride the waves of this new lifestyle of tiny living, small business ownership, and writer/author until I no longer can. Thank you. I am excited and ready for this amazing adventure. You are amazing!!! I can’t wait to follow your adventures!! I’ve been wanting to buy one of these double lofted cabin barns, but haven’t seen much in the ways of it being finished interior. Just the shell inside. Do you have or anyone else have pictures of what they’ve done inside? Hey Brian. I put up a two walls on the lower floor to enclose a full size bathroom. I don’t have any pics right now. I’ll try to share some with you soon. Awesome thank you. Did you tie in to the grid or go off grid? That’s what I’ve been debating on what to do. If I tie in I may have to raise the cabin at least 18″ off ground for a crawl space, but my wife isn’t to keen on that idea. Yes, we have on the grid. I recommend raising the cabin at least that much off the ground. You may want to go higher, if possible because. I wired the cabin myself with similar clearance and even as a small woman had some difficulty. Still on the grid man, gotta have the internet. lol. okay great. I’ll blog about it soon.